We know that choosing Thinkbaby bottles is a no brainer, as they are among the safest, most non-toxic baby bottles available. Now you can continue with safe, BPA free feeding well into the toddler years and beyond with Thinkbaby’s spiffy, new Complete BPA Free Feeding System. The bowls and cups are made with food grade stainless steel and then wrapped in polypropylene for a long life. All the dishes are free of Bisphenol-A, PVC, Lead, Phthalates, and Melamine. 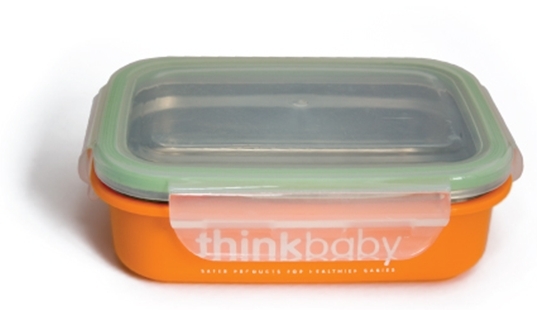 Air tight lids help keep baby food leftovers fresh, for less waste, and they make travel a breeze (no surprise spills). Brightly colored lids mean you can locate them in a snap, saving you time. We know that choosing Thinkbaby bottles is a no brainer, as they are among the safest, most non-toxic baby bottles available. Now you can continue with safe, BPA free feeding well into the toddler years and beyond with Thinkbaby's spiffy, new Complete BPA Free Feeding System.